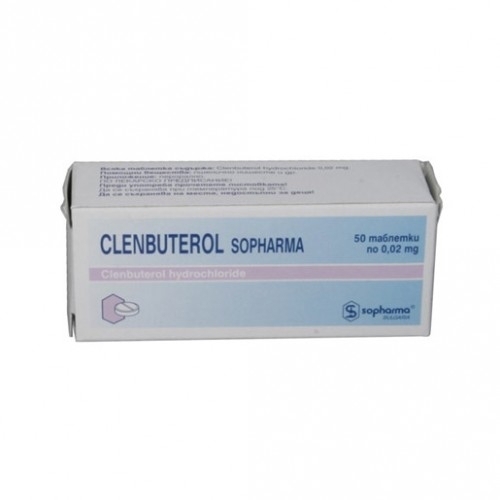 Clenbuterol Sopharma is a beta-2-agonist (excites beta-2-adrenoreceptors) and is used in many countries as a medicine for bronchial asthma treatment and other lung diseases. Due to its long half-life, clenbuterol wasn’t approved by FDA for medical use. Being a stimulator of central nervous system, it acts similarly to adrenalin, also having many in common with such CNS-stimulators like effedrine. Although the popular opinion, clenbuterol has half-life of up to 35 and not 48 hours. Clenbuterol is produced in the dosage of 20 mcg tablets, but also produced in form of syrup and inhalation solutions. Dosages depend on user’s reaction intensity to side effects, but anyway, in general it is 5-8 tab/day for males and 1-4 tab/day for females. Clenbuterol loses its thermogenic effect after 6-8 weeks of its use when the body temperature becomes normal. Its anabolic/anticatabolic properties disappear nearly after 18 days of usage. use of prolonged preparation action led to the conclusion that it is most effective to use clenbuterol cyclically 2 weeks after 2 weeks and for not longer than 12 weeks. Effedrine use is possible during the weeks of „rest” from clenbuterol. Side effects: nausea, vomiting, tremors, dry mouth, anxiety, heart beat, increased blood pressure, headache, dizziness, insomnia, muscle cramps, excessive sweat production. The most popular are muscle cramps, anxiety, headache and increased arterial pressure. Muscle cramps may be avoided by drinking 5-7,5 l of water per day also using bananas, oranges or potasium containing preparation of 200-400 mg per day, using on empty stomach before sleep. Headaches can be also avoided by using analgetics such as Tylenol (acetaminophen) at first symptoms, double dosage use might be necessary. After-course therapy: clenbuterol is used after the course in order to hel during restoration. This lets going on eating quite big amounts of meal without taking care on fat deposits. This also helps support strength and intensity during the trainings. Diet: same as during the course. Fatburning: the most popular use of clenbuterol, also muscle toughness is increased, vascularity, strength and view as on low-calorie diet. Among all known fat-burners, clenbuterol may be combined with T3. Diet: much protein (3g for 1 kg of weight), moderately carbohydrate containing (1-2 g for 1 kg of weight), little fat (0,5 g for 1 kg of weight). Alternative for steroids: clenbuterol has anabolic properties like steroids, but in fewer grade. Especially suitable for „naturals” in strength and toughness increase of the musculature. Diet: much protein, moderate amount of carbohydrates and lipids. Stimulation/restoration: clenbuterol may be used as a stimulator but the combination of ECA however will suit better due to shorter half-life period. Diet: carbohydrates should be included to you nutrition. The same cautions that are applied in case with effenedrine should be followed also for clenbuterol, although some people consider the combination of ECA to be tougher than clen. You shouldn’t combine clenbuterol with other stimulators of CNS such as effenedrine. Such combinations are not necessary and are potentially dangerous. Coffeine may be used for decreasing the possible over-loads and extrasystoles (extrasystole – heart arrhythmia that is characterized by its premature contraction which is followed by prolonged (compensating) pause which creates the feeling of irregularity), although this may be also a diuretic effect shifted due to electrolyte balance. Drink more water if you use coffeine. Majority of the users feel unpleasant side effects and are forced to stop using of clenbuterol because they start using it immediately with big dosages. Since the most unpleasant feelings come out during first 3-4 days. For the person who started using clenbuterol for the first time, the dosage shouldn’t exceed 40 mcg in first day. Don’t use clenbuterol after 16 o’clock and drink enough liquid, 5-7 l per day. All the brands, that produce clenbuterol are not equal in effect. Different brands lead also to different results. Clenbuterol belongs to adrenomimeticalkie substances and is used in order to cut short and prevent bronchial asthma attacks and for treatment of other lung illnesses. Clenbuterol action is explained by its stimulating action at beta-adrenoreceptors. Being beta-2-adrenostimulator, clenbuterol functions as a fat-burner by bounding with beta-receptors in fat and muscle issue in the organism. When this bond is formed, receptors are involved to a series of chemical reactions that lead to the production of cAMP (cyclic AMP) which is a universal intermediate of intracell signal with the outer side of cell membrane to the effector cell systems, whose action causes generalized reaction of the cell to the impact of the outer biologically active substance, for example, a hormone. Interacts with lipase in fat deposits, whose phosphorylation leads to release of fat acids. Less affects beta-1 receptors which is expressed in excitability and myocardium contraction function increase. All these processes affect body temperature increase which makes the organism burn more calories. It is also important that such beta-adrenostimulators like clenbuterol, showed the ability to increase T3 in the organism which, unconditionally, adds more possibilities to clenbuterol during fat-burning process. Besides these, clenbuterol has anticatabolic features, thanks to its ability to block Ca++ (calcium ions) that participate in protein and skeletal musculature decomposition. Such a block way lets avoid losses of muscular fibers. One of the most important aspects that we would like to highligh is the old belief on the possibility to use clenbuterol as an anabolic for humans. This myth is based on the experiments that were held on rats and cattles who showed such results. But the dosages, used on animals, when converted to human dosages, may kill. This is a very important moment for use of any preparation which is not taken into consideration by many people. Clenbuterol should be applied cyclically 2 weeks after 2 weeks. Such an approach is built on two main principles. Beta-2 receptors regulation decrease: this is the reason that directly affects the effectivenes of clenbuterol use and depends on cyclical use of the preparation. Long half-life period: includes two phases of the stated process, the first is the quicker one – about 10 hours and then the second that is longer – some days. That is why the theory of using clenbuterol 2 days after 2 days is simply meaningless. If you use clenbuterol following such a schedule, beta-receptors don’t receive enough time to restore.